Team Magma and Aqua awaken Groudon and Kyogre. Ash beats Tate & Liza and earns a Mind Badge. May wins the Izabe Contest. Brock's Lombre evolves into Ludicolo. Ash beats Juan and earns a Rain Badge. May wins the Pacifidlog Contest. Ash meets a Hoenn League rival; Morrison. May enters the Grand Festival. May knocks Harley out of the Grand Festival. Drew knocks May out of the Grand Festival. Ash's Snorunt evolves into Glalie. Ash arrives at the Hoenn League and meets another rival; Tyson. Ash, Morrison and Tyson all progress to the Knockout Rounds of the Hoenn League. Ash knocks Morrison out of the Hoenn League. Tyson knocks Ash out of the Hoenn League. Tyson wins the Hoenn League. May and Max both return to Petalburg Town. Brock returns to Pewter City. Ash returns to Pallet Town. 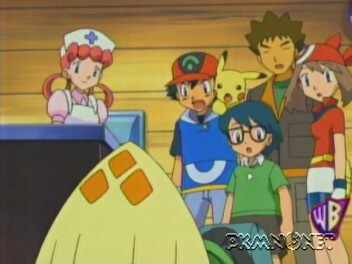 Ash goes to the Viridian Gym and is defeated by Agatha. Ash learns about the Battle Frontier.